Sponsh selected as best chemical startup in 2018! Sponsh wins the GoudenKiem Award 2018 🌱, the prize for the best chemical startup in The Netherlands. The Sponsh team and Eindhoven University of Technology received the Gouden KIEM on 4 December 2018. 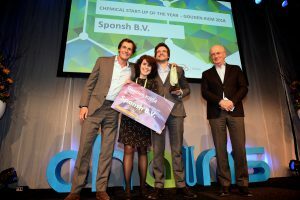 With the Gouden KIEM, NWO and Holland Chemistry reward the best chemistry startup each year. The prize consists of 25,000 euros for research project and is awarded during the chemistry conference CHAINS. We made our first demonstrator! We recently made a major breakthrough in development of our material! In close collaboration with the Deutsche Institut fur Textile und Faseforschung (DITF.de) in Denkendorf, we managed to scale up the material from 1cm2 (lab proof-of-concept) to several 50 cm2 demonstrator. This size might still sound small, but within the chemistry and technical textiles realm, this is a huge step. We managed to successfully apply the coating several textiles. We achieved very high grafting ratios and the so-called ‘characterisation’ looks very good. We are now going to test the water production of these demonstrators in humidity chambers. If that proves out, we’ll test them in real life conditions in South-Africa in January and February. In the mean time, we’ll continue scaling up the material and improving the water production. 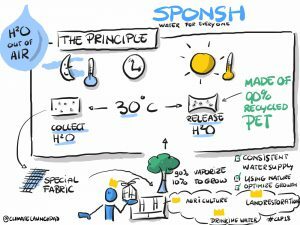 If you are willing get to know Sponsh better, check out this wonderful visual story made at ClimateLaunchpad event. 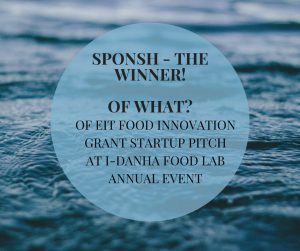 Building Global Innovators – with the support of #EITFood – hosted the Idanha Food Lab – The ultimate #Agtech event which brought together #FoodTech investors, corporates, start-ups & entrepreneurs. 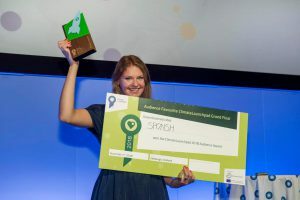 In a top-class pitching competition Sponsh got the first place and prize for innovative business changing the face of agriculture. We are thankful and very happy! This unique event, held in Monsanto, was all about making bold advances towards a circular economy ♻️ in food production. Sponsh have won Accenture Innovation Awards in NUTRITION! Check out! Search for more info at our Facebook account , as well as our Instagram, where you here you can hear Sponsh pitching and follow all our news. Audience Award of Climate Launchpad goes to Sponsh! Also, we are in TOP 10 of the 135 best global startups. ClimateLaunchpad is the world’s largest green business ideas competition, with mission to unlock the world’s cleantech potential that addresses climate change. The competition creates a stage for those ideas. ClimateLaunchpad is part of the Entrepreneurship offerings of EIT Climate-KIC. Read more. Search for more info at our Facebook account , as well as our Instagram, where you can follow all our news. We got the opportunity to share the Sponsh project on National Portuguese Television. Watch the video to find out more about our ideas and technology we developing. 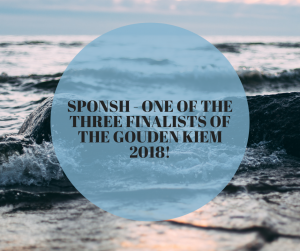 Sponsh is the finalist for Gouden Kiem 2018! Sponsh have good and exciting news. We have been selected as one of the three finalists of the Gouden KIEM 2018! Competition for chemistry start-up. KIEM reward the most exceptional example of interaction between young businesses and knowledge institutions (such as universities and universities of applied sciences). KIEM highlights form a vital link between valorising (academic) knowledge and solving major societal challenges in the areas of health, food, energy, transport and resources, raw materials and the environment. 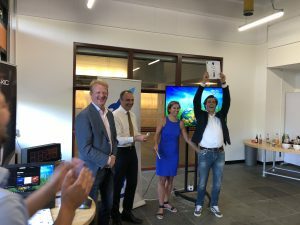 Sponsh wins ClimateLaunchpad Benelux 2018! 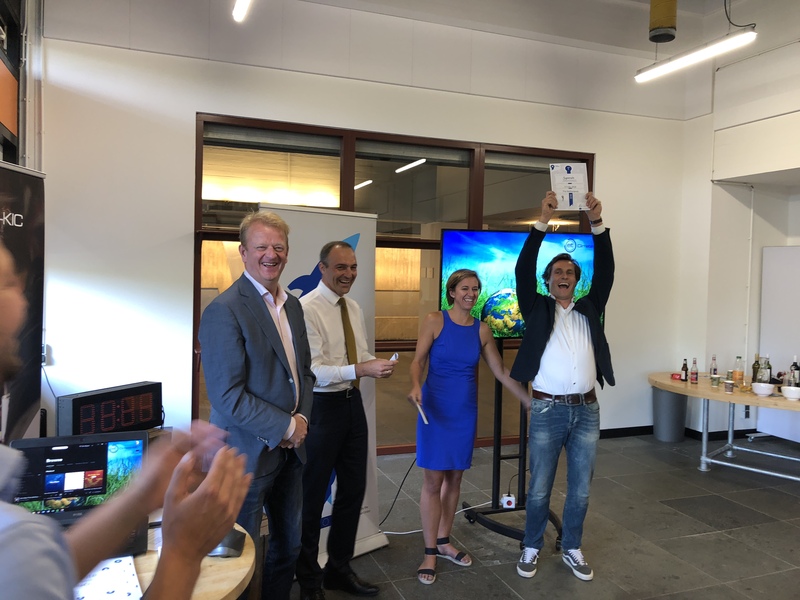 Out of 31 applicants, Sponsh was one of the 12 CleanTech startups that were selected to join the Climate Launchpad 2018 competition in the Benelux. We had a fantastic bootcamp in Belgium as preparation for the final pitch day. 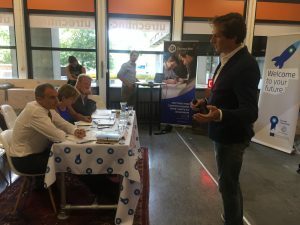 On the big day on July 13th, Sponsh and seven other startups pitched together for the Climate Launchpad grand jury in Utrecht. And… we won! Whoop whoop! 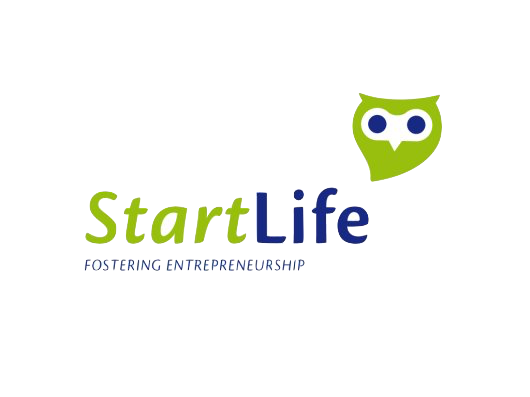 We’re in the StartLife incubator programme! This Tuesday we successfully pitched our plans to the Review Board for Gate-1. They unanimously accepted us into the programme. This is the entry gate for the programme and provides us with intensive coaching, training, networking and seed-funding. The incubator programme is designed for agritech startups, so perfect match Sponsh. We’re now focusing on our customer validation.